Vishal congratulated him and asked him to address the challenges facing the people of RK Nagar. Politician TTV Dhinakaran recently won the much-hyped RK Nagar bypoll and left many in the political fraternity a bit surprised. Shortly after his emphatic win, actor-producer Vishal took to Twitter and congratulated him profusely. In his post, the star requested him to use his position to make a difference and address the major issues facing the RK Nagar constituency. “Hoping that Mr TTV Dhinakaran will address the entire pressing issues of RK Nagar like sewage water mixing with drinking water, fishermen issue, toilet facilities among others in the near future and in such circumstances my full support is guaranteed for him,” added Vishal. Not surprisingly, Dhinakaran took note of his tweet and thanked him for his wishes. “Thank you for your wishes,” he wrote. In case you did not know, the RK Nagar constituency fell vacant in December 2016 after the death of former CM J Jayalalitha. Vishal was keen on contesting the bypoll as an independent candidate and making his political debut. However, these plans went for a toss when the Election Commission rejected his nomination papers under controversial circumstances. Following this, he wrote an open letter to the people of Tamil Nadu and promised them that he would return to politics soon. “I am obliged to inform the People of Tamil Nadu that I decided to Contest in R.K.Nagar By-Election on my own and without the influence of any Political Party or any individual whatsoever, but only with pure intentions to Serve the People from the bottom of my heart. The rejection of my nomination paper was totally unethical & unjustified and the events that followed are there for all the People of Tamil Nadu to see and understand that democracy has been buried to the ground. I thank all the good-hearted people in RK Nagar, across Tamilnadu and across India including the press, the police, the advocates, political leaders, my fans, friends, family and all well-wishers who supported me and stood by me. I will continue to serve the people and fight for democracy and will return to politics in full swing,” Vishal had added. On the professional side of things, Vishal was last seen in the crime-thriller ‘Villain’ which marked his Mollywood debut and opened to a decent response at the box office. In it, he was seen alongside veteran actor Mohanlal and the lovely Manju Warrier. Talking about the film, he had said that sharing screen space with ‘Lalettan’ was a terrific/surreal experience for him. Talking about the film’s success, Vishal had said that it worked courtesy its ‘winning’ script. At present, he has ‘Irumbu Thirai’ in his kitty. In the action-thriller, he will be seen opposite Samantha Akkineni and ‘Action King’ Arjun. 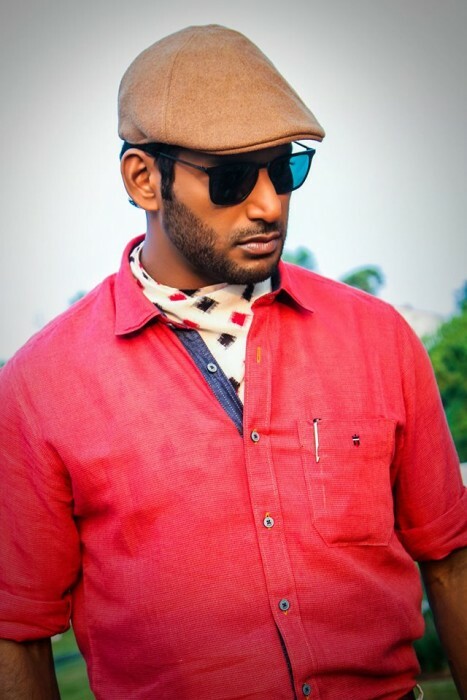 Recently, director PS Mithran had said that Vishal was originally interested in playing the antagonist but changed his mind post some persuasion. So, did you like Vishal’s message for Dhinakaran? Comments, please!